I know for many the idea of needing patience when it comes to tipsters is a dirty word. After all you are paying a tipster to back winners, so if they keep tipping up losers, you should get rid of them. The problem with that attitude is that it doesn’t take into account the laws of making money across all forms of investment AND the need for realistic expectations based on the type of tipster you are dealing with. As whether we like it or not, when trying to bet profitably, it is a marathon not a sprint and it’s only the patient amongst us who benefit in the end. If that sounds unpalatable to you, then fair enough – you are probably not suited to the cut and thrust of following tipsters to profit. Not everyone is. Yet if you are determined to make your betting pay and are keen to see how we can help you do this, just as we have done for Dave, Michael, Billy and many others, please read on. The first thing to understand is that betting for profit is in so many ways, very, very similar to any other form of investment. Whether you are buying, shares, gold, houses or bitcoin – he principles are exactly the same as betting, including the concept of High-Risk, High-Reward. This simply states that the greater return you are looking for, the greater the risk you will have to take to make it. Bitcoin is a classic example of a very high risk investment – as it went from $1,000 on January 1st 2017 to $17,000 by the end of 2017, before since dropping all the way back down again and up to its current price of around $4,500. Anyone investing in bitcoin over the past 2 years would have needed nerves of steel as you were taking a huge risk. You might have made 17X your investment, yet could easily have lost that – all depending on when you stuck your cash in. Although usually less extreme in its ups and downs, the stock market also teaches us about the balance between risk and reward and the need for patience to reap the benefits. To give a good example of this, I invested last year in specific stock market fund, which I researched in-depth prior to sticking my money in. This made it clear that this was a medium-to-high risk fund, which whilst likely to make great returns over a 5 or 10 year period, would be very up and down on a monthly and sometimes yearly basis. And oh how that has rung true in reality – as you can see from the table below, which lists the % increase or decrease after each month so far. 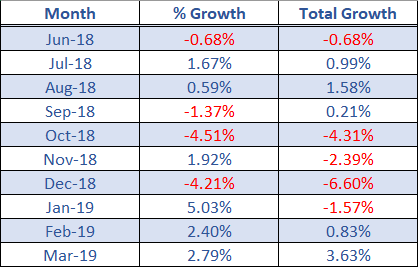 This table reveals how after starting off reasonably OK in June, July and August – a really bad run between September and December saw it down 6.6% in total. Come 2019 and following a good start to the year, I am now up that 3.63% figure, which whilst below the long-term expectation, is still a profit nevertheless. To get the full rewards, I am just going to have to be patient. Once again, when it comes to the stock market, an understanding of what you are investing in really does help you make the right decisions with your money. Had I panicked and quit the investment fund at the end of 2018 when I had lost 6.6% of my bank – that clearly would have been the incorrect decision. I would have missed out on the 10.23% it has made since then in the first quarter of 2019. I wasn’t to know when this fund would rebound, yet I knew it would if I simply bided my time. Yet, whilst many of us will understand this when it comes to the stock market, not enough people apply this logic to the tipping world. I see it all too often – people join a tipster after 1 good month and then leave after 1 bad month. Not giving them enough time for the investment to be rewarded. A good example of the need to be patient with tipsters comes in the form of one very highly rated tipster, who sits in our ‘Hall of Fame’. 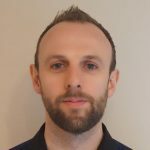 He is a proven expert and his record of over 1600 points profit at 17.6% ROI dating back to 2013 highlights him as a tipster that knows his tipping onions. Yet if you are going to follow him in, then you have to be patient, due to the fact he backs long shot horses at an average price of just under 11/1. At these odds it’s to be expected that you will experience the occasional losing run and over the 65 months he has been actively tipping, 20 of them have made a loss – a strike rate of 69% winning months to losing months. Although the 8-9 winning months will completely outweigh these losses, if you jump ship after a losing one, you are short-changing yourself. Yet this is exactly what some punters are doing and have done during the past year – making the same mistake over and over again. Why Are They Jumping Ship From This Tipster? The reason they are jumping ship too soon becomes easier to understand when we analyse the monthly breakdown of his performance over the past 12 months. Should you have joined on March 1st 2018, then come the end of May 2018, you would be sitting on a 58.4 point loss from 202 bets. How many of you would have quit then? I dare say quite a few. If you had done so, then you would have missed out on the 208.3 points made in June and July, which would have left you up 149.9 points overall. 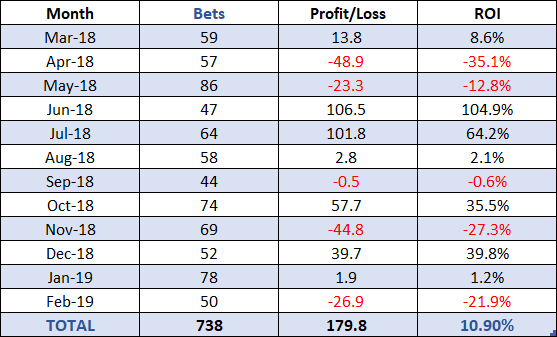 As this table indicates, there are peaks and troughs across the year but taken as a 12 month snapshot, this tipster did return a fine profit. His 12 month ROI of 10.90% is a little below his expected 17% ROI, although in the 4 months prior to March 2018, he did make another 177 points @ 30.14% ROI, which again illustrates the value in patience. Eyes On The Long-Term Prize! I hope this article has helped to shed some light on how to approach betting from a profitable point of view and the need for patience when following tipsters. I would love to be able to say to you – “I can guarantee you will win month-in, month-out”. Yet that is not true and I won’t sell you a lie. There are plenty of people out there saying exactly this and usually its trying to flog some get-rich-quick-scheme. The Smart Betting Club is different as we are geared towards helping you make a sustainable profit betting. We are not interested in helping you make a quick buck, but instead giving you the expertise, information and resource to make it pay year-in, year-out. 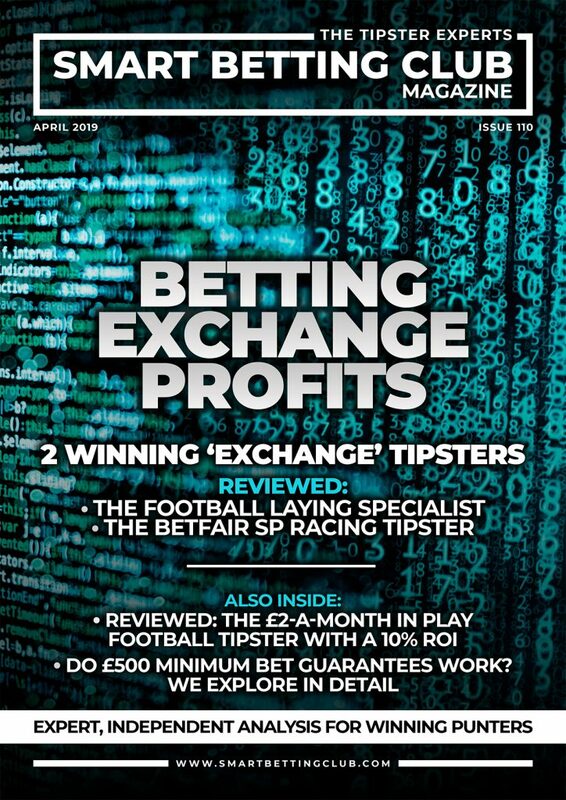 This includes things like helping educate you on not just who the best tipsters are but the setting up of betting banks, the best bookmakers or exchanges to use and so on. I like to think that this long-term approach is why we have been around since 2006, since when we have helped hundreds, if not thousands of punters make their betting a success. You can read some real-life examples here.